Replacements, a North Carolina–based tableware giant, carries more than 425,000 patterns. At 500,000 square feet, the Replacements showroom and warehouse is a temple to dinnerware, with every imaginable pattern on hand. With 34 years of experience selling dinnerware, Bob Page is an authority on consumer trends. Younger shoppers aren’t buying less, he observes, but they are gravitating toward simpler designs. The warehouse’s inventory includes everything from 19th-century heirlooms to contemporary chinaware. 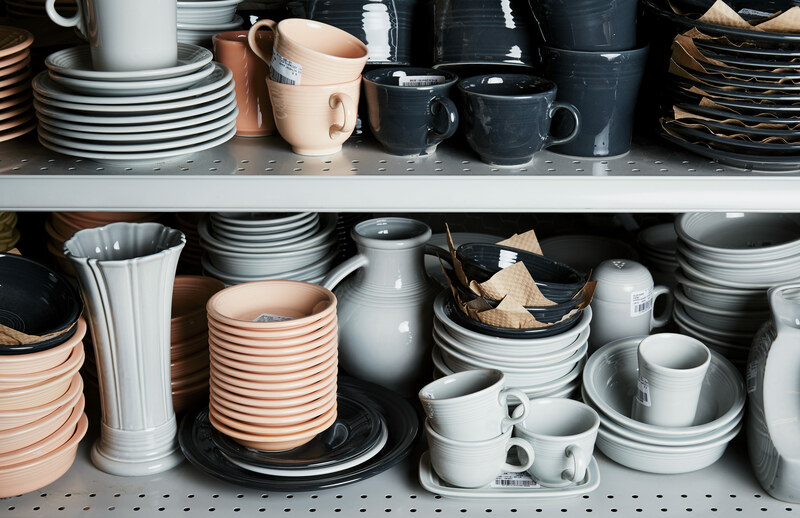 The variety of products in stock makes Replacements feel like an endless dinnerware emporium. "I’ve heard people say, 'My grandmother had that pattern,' or 'This is what we had Sunday dinner on,' and it brings back feelings," recounts Page. The American Modern collection by Steubenville is perennially popular among midcentury enthusiasts. Replacements founder and CEO Bob Page found his calling in completing people’s prized dinnerware collections. Where did you get the idea to round out people’s damaged or lost dinnerware sets? I used to work as an auditor and I hated my job. My weekend hobby was going to flea markets. People would ask if I could find things for them, so I had a little recipe box that I kept index cards in, and I would make notes of things that they were looking for and try to find them. I had a gut feeling before I quit my job that I could make a living doing this, but I had no idea that there would be so much demand. We receive up to 70,000 dinnerware pieces weekly, about as many pieces as we sell. That’s why our warehouse is about the area of eight football fields. Your online presence is formidable. Ours is the perfect business for the Internet. We have about two million images that people can view. Somebody can click “Find This for Me” on our website, [the pattern they requested] gets downloaded to their file, and the day it comes in, our computer emails them to let them know we found it for them. People absolutely love that service. Why is a brick-and-mortar presence important? The showroom is less than 50 percent of our business, but I wouldn’t dream of closing it. There are so many people who love to come here—about 50,000 a year. We have carved Italian mahogany cases, we have a set that says Oklahoma Territory on the back, and we’ve got one tremendous showcase that supposedly came out of the summer home of J.P. Morgan. It’s an attraction. What’s one of the more unexpected requests you’ve received? A long time ago, Ted Kennedy broke the lid to an old Lenox teapot, probably 40 or 50 years old. It was not typical, but we found it. Why do you think people are so much more emotionally invested in dinnerware than other heirlooms? I’ve heard people say, “My grandmother had that pattern,” or “This is what we had Sunday dinner on,” and it brings back feelings. It’s not so much a product as a memory that we’re selling. We connect customers with their most cherished memories.